From the fabulous ladies at Mickey and Chicken, the way to truly relax and lounge in luxurious beauty and inviting comfort. Lounge in luxury at home, by the pool, or…anywhere in this beautiful and comfortable lace kimono cardigan. It will look awesome with leggings in the fall, skinny jeans in the winter, cropped pants in the spring, or cut off shorts or a bathing suit in the summer. There really is nothing this beauty can’t do. Mickey and Chicken is a very stylish shop run by Janet London and her two beautiful daughters. They enjoy being very creative as well as making sure everything they make to wear is very soft and comfortable. Janet loves designing accessories that look and feel great – like your favorite t-shirt, only better! Mickey and Chicken’s shop is filled with many other wonderful items such as infinity scarves, very stylish totes, handmade jewelry and even hand poured candles. I hope you’ll stop by and see Janet at Mickey and Chicken. She is truly a nice lady and she’ll make sure that you’re very happy and well taken care of. What’s not to love? Just save some goodies for me! This is so clever! A modern statement necklace made with gray pearls and steel safety pins! Heather of BluKatDesign always creates the most imaginatively stunning statement pieces for her shop using unexpected and fascinating items. She puts them all together so beautifully. It’s always a treat to see what she will come up with next. Heather describes this safety pin design as edgy but elegant. A modern pearl necklace that can be dressed up for an evening out or worn with just jeans and t-shirt. This is all held together with an ultra modern 18″ steel wire cord with screw clasp. This is all handmade by Heather, and arrives in a decorative box ready for gift giving. Snag one for yourself and a friend! This is so cute! A pink key chain purse! This convenient key holder will add that hint of sophistication to your everyday style. It is handcrafted from the softest calfskin leather, and there is a hook for your belt so you won’t have a pocket full of keys. 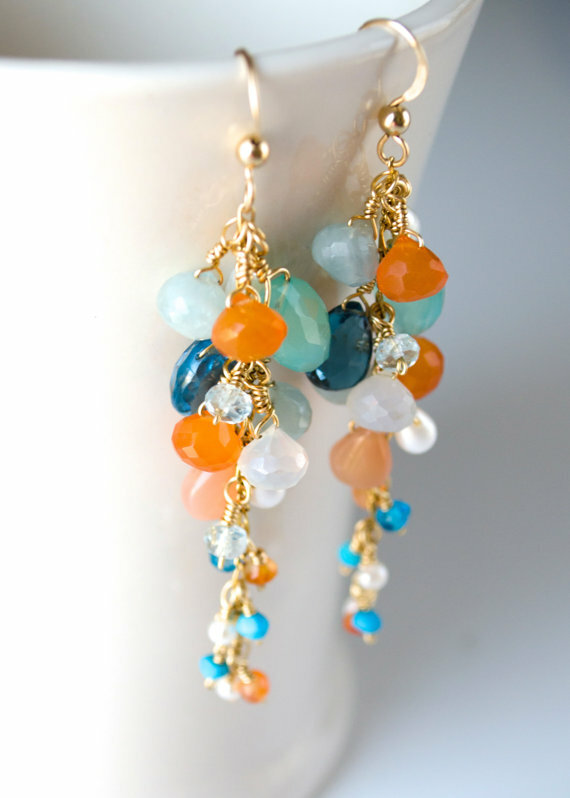 This luscious pair of long bridal earrings feature a cluster of the following gemstones: London blue topaz, white pearls, turquoise beads, aquamarine and chalcedony onion briolettes and peach moonstone on a long 14k gold filled figaro chain. Finished with 14k gold filled ear wires. The earrings will be perfect for a spring/summer bride or anyone else who wants to add a pop of color to their attire. Though long and multi-stone, the earrings are not heavy at all and are really fun to wear. This very cute retro inspired sewing pouch/pincushion is made with a mixture of polka dot and Japanese fabrics. The quilted front pocket has been lined with cotton wadding and red polka dot fabrics and decorated with cotton lace,ricrac and a button. The pincushion area has been filled with wadding and decorated with a mini polka dot button and strawberry themed ribbon. 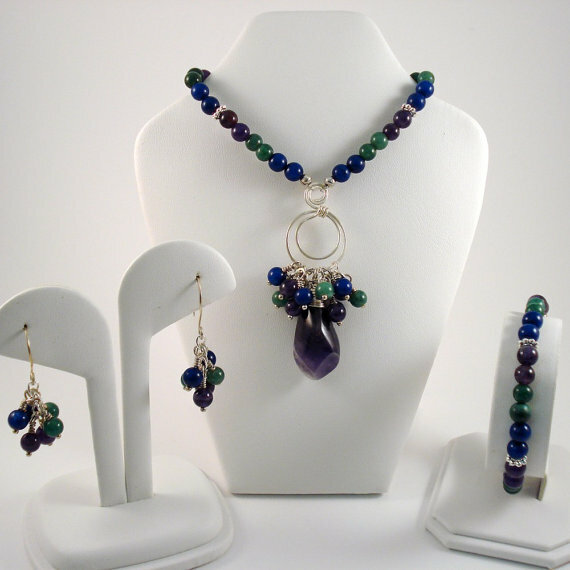 This Peacock Amethyst Jewelry Set has been handcrafted using deep purple Amethyst, lovely green Aventurine and hazy blue Lapis Lazuli gemstone beads in this beautifully coordinated set of jewelry. The set includes a necklace, bracelet and earrings. Gorgeous jewel tones! Please visit PoskettsMiscellany for full descriptions of each jewelry item. – Amethyst is a Stone of Wisdom, believed to calm emotion and assist in attaining wisdom. Often worn during meditation, Amethyst is said to create clarity of thought. – Aventurine is a Stone of Prosperity, bringing the wearer good luck and opportunity. Associated with the heart chakra, Aventurine is said to increase perception and creative insight. – A powerful stone, Lapis Lazuli can open many chakra centers. Dreaming of this dark blue beauty is thought to foretell forever, faithful love. *Please note: Gemstone properties are for entertainment purposes only. 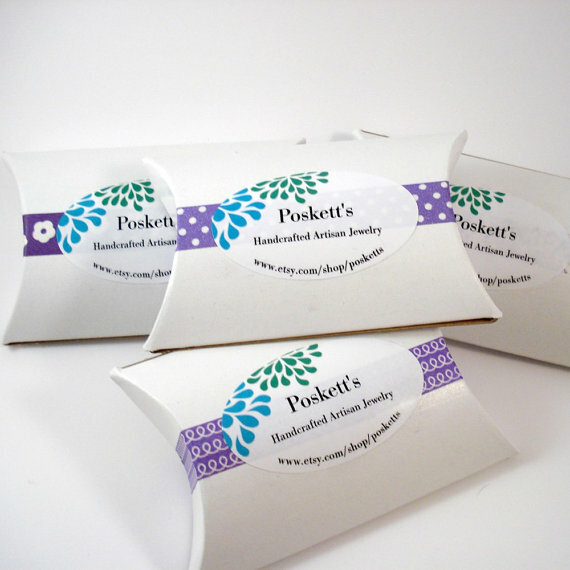 Your jewelry purchase will come packaged in a white pillow box and sealed with purple Washi Tape.